This is part five of the Small But Mighty Dragon crochet-along. In this part we will be making the arms and sewing them to the body. Please note: I used a pin to pose the arm in the photo. If you want poseable arms you would have to sew wire inside of them. 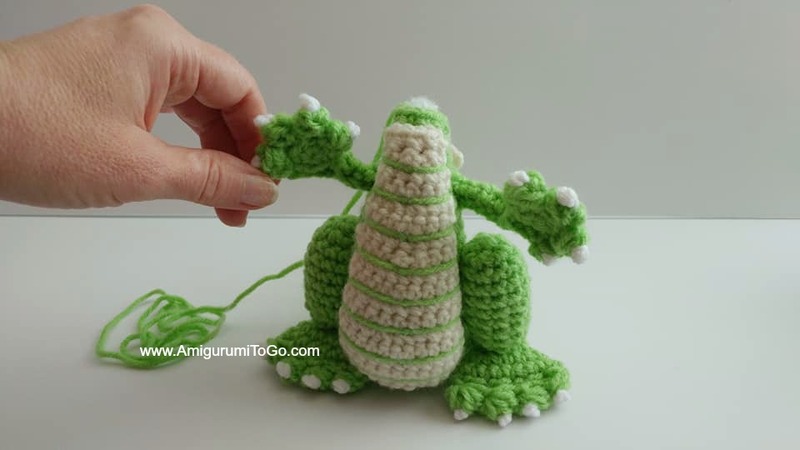 I do not include adding wire in the pattern or video. There are 2 videos for this part of the CAL. Video links are given in the pattern below. the end of each row. Each row has a sequence. Example: 1sc then 2sc in next st means repeat that sequence 1sc then 2sc in next st followed by 1sc then 2sc in next st over and over to the end of that particular row. The number inside the parentheses ( ~ ) is the number of stitches you should have at the end of that particular row. 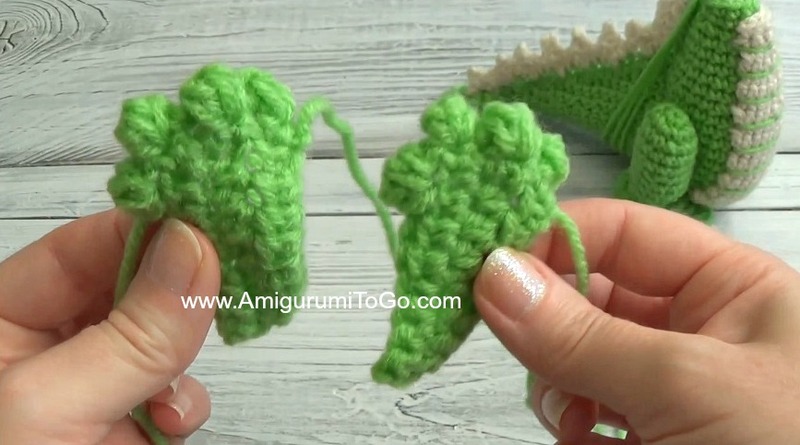 This video starts with the Palm then shows how to crochet the arm. 1) make a loop with 6st, sl st next st.
f/o leaving a long tail for sewing.You will use this yarn tail to assemble the arm and sew it to the body. Pull the starting yarn tail to close up the center hole, if there is one. 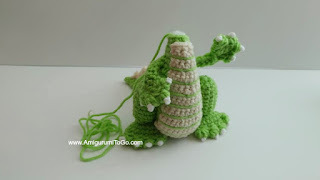 Cut this starting yarn tail up to about 1/4 inch or so.Set aside and make the arms. This video starts with the nails then it shows how to assemble and sew the arm. Make the nails the same way you did the toes. 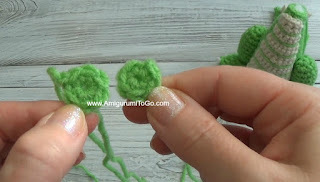 1) Place the palm into the center of the bobbles, wrong side down. 2) Sew the palm in, going back and forth, bringing the yarn tail through a bottom stitch of the bobble and then through a stitch of the palm, joining them together and at the same time sewing the palm to the hand. 3) Once the palm is sewn in, roll up the sides of the arm so the edges touch. Lay any yarn tails there is inside the arm. 4-5) Sew up about 3/4 of the arm, leaving the last bit open. Knot off leaving the yarn tail for sewing to the body. 6) Sew the arms over the 17th and 18th row of the body. Congratulations to us all! We are now finished part five of the schedule. You can post your photos on facebook in the comments of this post. See you soon for part six!